Watch out for in-app purchases: It’s very easy for kids to rack up in-app purchases—without realizing the charges are real versus “money” earned in certain games. These unexpected costs can be managed through the device’s settings. Play before they do: It’s easy to rely on a rating for determining app and game appropriateness for our kids. But, ratings are only a guideline. It’s always a good idea to spend some time playing with an app or game before letting your child download it. Download before you go: Most TV providers offer customers a free app that lets them take their shows on the go. Downloading On Demand or DVR-recorded content to a mobile device helps control how much video is consumed without racking up data charges. Look for WiFi: Beyond free WiFi at obvious places, some internet providers, such as Xfinity, offer free hotspots in many popular places. Use technology to set parameters: There are a number of apps and devices (some free, some available for purchase) to help parents monitor and control WiFi access and usage. Comcast’s service, xFi, which is FREE to our customers, lets parents schedule WiFi access times for individual devices, such as pausing access during bedtime. Take back dinner time: Similarly, the xFi app gives customers the ability to pause all devices in the house so families can engage with each other over dinner. Get creative with other ways to keep kids busy during travel: There’s nothing wrong with some good, old-fashioned road trip games. We might be surprised how much our kids enjoy the License Plate Game or 20 Questions – especially when parents join in. According to a the Wall Street Journal article, audio producers are attracting the next generation of fans with programs like ‘Chompers’—a twice-daily, two-minute show that coincides with teeth-brushing time. Children today don’t typically have direct access to podcasts—they often tune in on their parents’ phones instead—but industry watchers believe that smart speakers will help change that. The program is meant to make technology more accessible to visually-impaired students at the Watertown school. Click here for more. There is a wide gap between teachers and parents concerning technology, with teachers saying it has harmed students’ mental and physical health, according to a majority of educators participating in a recent Gallup survey. Parents surveyed were more likely to say that technology helps support students’ mental and physical health. Check out this Washington Post article for more. YouTube will soon launch a new choice for parents seeking programming for their children with a version of its Kids app that offers only videos handpicked by YouTube staff. The algorithm-driven version will still be available. For more information, check out this Buzzfeed article. 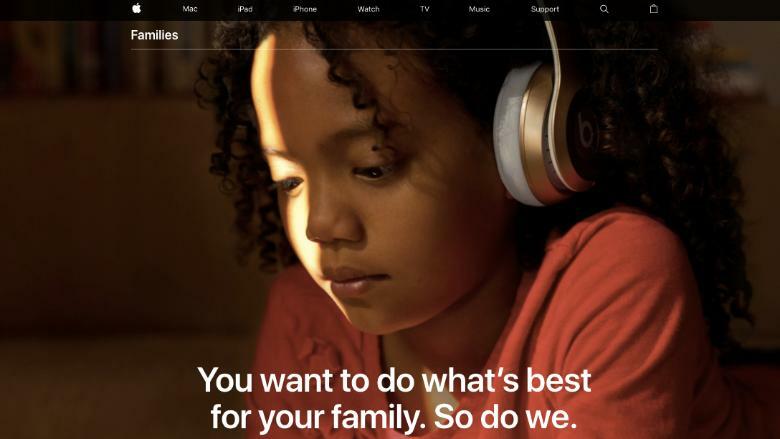 The new “Families” page — located at apple.com/families — is an attempt to help parents understand and use all the features that are already floating around on Apple devices. Many parents may not know that they have the power to track their children’s location, monitor and limit their purchases, and filter what content they can see on their devices. It also covers privacy, health related settings like sleep mode, sharing between family members, and the use of Apple devices in education. The company also updated its support page for parental controls.